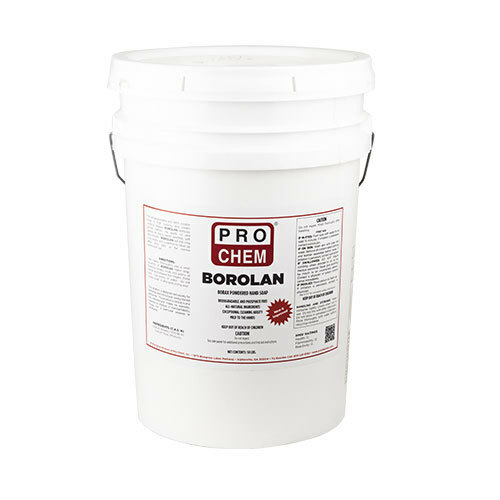 BOROLAN | Pro Chem, Inc.
BOROLAN is a high quality, powdered soap that contains special borax cleaning agents that provide gentle agitation to scrub away the most stubborn dirt without drying or chapping skin. This fragrance-free formula works well in all powdered dispensers. It rinses away completely with water, leaving no annoying grit or heavy perfumes. It easily removes dirt, grease, grime, ink, paint, oil and more. Wet hands and sprinkle with product. Rub hands together, adding more water as necessary for lather. Work into skin to loosen dirt and grime, then rinse thoroughly with water.